In my last post, I briefly reviewed a paper from the Rinberg lab where they recorded from the olfactory bulb of awake, head-fixed mice. 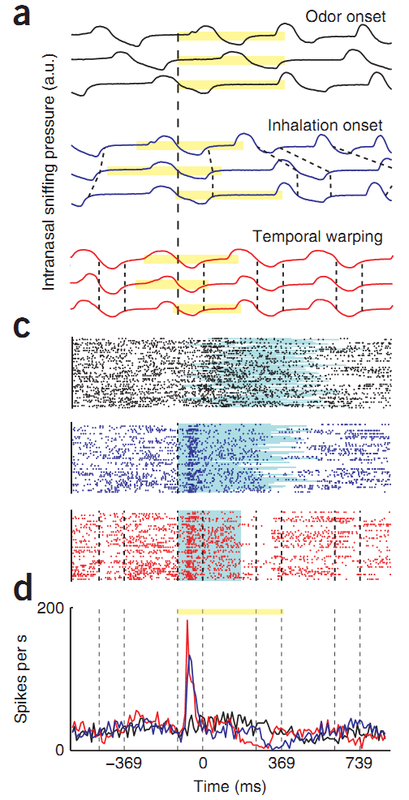 When they were analyzing their neurons' responses, they performed a time-warping manipulation on the data that increased the precision of the responses. Today I'm going to present some counter-evidence that shows why their time warping is a bad idea. 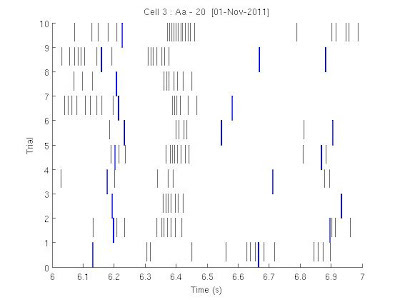 The first figure of their paper clearly explains how they time-warped their data. They recorded extracellularly from mitral cells in the olfactory bulb while presenting head-fixed mice with odorants. In their recording, as in previous studies, if they did not perform any temporal alignment, they saw very weak responses in response to odorant application (black traces, below). However, it is well known that sniffing can influence olfactory bulb activity, so they realigned all of their mitral cell activity to the first inhalation following odor onset (blue traces, below). When they did this, they found that the mitral cell responses were quite strong, and around 59% of odor-cell pairs were responsive. Aligning responses to inhalation reveals odor responses. a. Diagram of inhalation alignment, and temporal warping. Odor presentation in yellow. c. Spike rasters to odor under three alignment paradigms: to odor (black); to inhalation onset (blue); and time-warped (red). d. Peri-stimulus time responses(?) of the responses in c.
From Shusterman, et al, 2011. Not satisfied with the precision of their responses, they performed one more manipulation. The breathing cycle, while fairly regular, does vary; and they reasoned that duration of the breathing cycle could influence neuronal activity. To normalize this, they fit curves to both inhalation and exhalation, and then stretched time (and moved spikes) until the breaths fit a standard breathing cycle (red traces, above). When they did this, they found that both the precision and magnitude of responses were increased. Second, I think that the timing of mitral cell responses is in large part dictated by the temporal dynamics of the olfactory epithelium. The olfactory epithelium, in turn, has its kinetics determined by the taus of the G-protein signaling cascade, and the concentration of odorants in the epithelium. The kinetics depend on inhalation onset and intensity, not phase. While I wait for my mice, I have been performing head-fixed recordings from the olfactory bulb of awake mice. In general, I've been getting population responses in line with what the Rinberg lab has suggested: ~50% of the odor-cell pairs in the OB differ from baseline. Like the Rinberg lab, the Carleton lab aligns responses to inhalation onset. Yet, unlike the Rinberg lab, we have not performed any time warping. 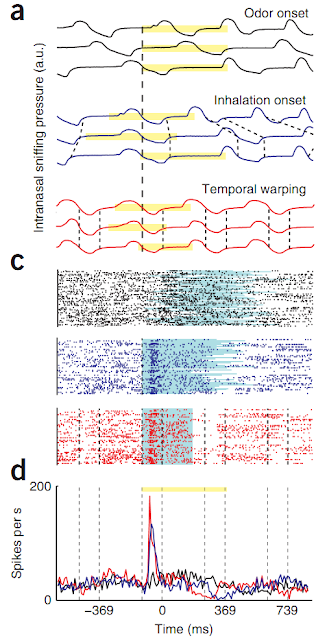 After seeing the Shusterman paper, I took a closer look at my data, to see whether time-warping makes sense. In general, respiration is regular enough that time-warping would little effect the responses. However, I found a few cases where time warping is a bad idea. 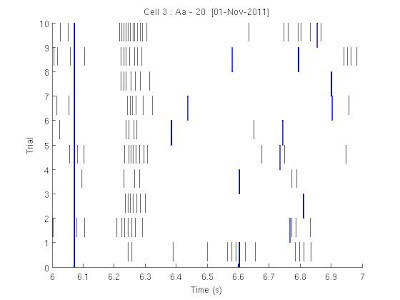 Raster plot of a neuron's response to Amyl Acetate. Amyl Acetatate began application at t=6s. Blue lines are inhalations, black lines are spikes. Ten trials shown. We can also align this data by moving time such that the first post-odor breaths all occur at the same time. If you do this, you can more clearly see the strong response to the odor. This response is fairly long, and has a high firing rate (>100Hz at its peak). Same raster plot as above, except aligned to the first inhalation following odor. Here the response is much clearer. And now I can finally address the issue of whether time-warping is a good idea. In the example above, there are two trials with short breaths, trials 6 & 7; and two trials with long breaths, trials 8 & 10. Despite the different lengths of these breaths, both of these trials have high amplitude firing rates between 6.2 and 6.3s. If you were to time-warp these trials, you would be moving the spikes from trials 6&7 later in time, and the spikes from trials 8&10 earlier. Both manipulations would cause a decrease in precision. This is just one extraordinary example, but it shows that time-warping can have deleterious effects on precision. In my view, if you are recording from the olfactory bulb, you should align all your responses to breath onset, and truncate your breaths to the same standard breath. I hope you are convinced that time-warping your data is a bad idea for mitral cells in the olfactory bulb. If I've missed anything, please let me know in the comments. The cells don't need to be psychic. They just need to be communicating with the brainstem CPG controlling breathing, no? The entrainment could be weak, and by receiving efference copy of the cortical modulators of that CPG, the cells could easily known ahead of time when the next inspiration might occur. So I did a bit of reading and thinking on this, and you are right in theory. The OB could be receiving a copy of the breathing cycle in phase-space. However, I could not find evidence that it actually does. For example, a review by Buonviso from 2006 mentions a single paper from 1979 when considering centrifugal input.